If you are interested by the topic, you can read the original discussion on this forum thread. Chema also pointed out that having a debugging expansion to allow Oricutron to communicate with a modern IDE would be nice, resulting in NekoNoNiaow writing a ticket requesting external debugger support. We will see how it goes, if you are interested the post is here. On modern machines you have heaps of CPU power, many cores, GPUs that can alleviate the work made by the other processors, sound cards that can play audio on their own. On the machines like the Oric, not so much luck: There is no dedicated GPU, no DMA access to replay music, no sprites, no copper list. Everything that moves or plays is entirely made through actual 6502 code running... and this processor is not the fastest around. So let's get some numbers. First, there is the concept of Frame. The Oric is generally connected to a CRT screen running at 50hz1, meaning that the screen gets refreshed every 50th of a second2. A 1mhz processor can execute 1.000.000 (1 million) cycles per second, so if you divide that my 50 (because of the 50hz refresh frequency), you get 20.0000 (20 thousand) cycles per frame. The actual real value is 19968 cycles, which is important for things like setting the correct VIA interrupt values, but as far as profiling goes, 20000 is easier to remember. 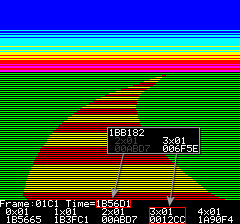 Another value we can derive from these numbers, is the rough number of clock cycles per scanline: 19968/312=64: We can execute 64 cpu cycles during the drawing of each of the horizontal screen lines. What this all means, is that if your main loop runs in 19968 clock cycles or less, then your program can refresh the screen at 50 frames per second, giving some nice and smooth animation and blazing fast keyboard and joystick reaction. When you reach the 40000 cycles per frame, you are now in the 25 fps range, which is still acceptable for most games. When you start to drop in the 10 or less fps range, you can forget games based on reaction time and smooth animation, they will just be painful to play. For a complete description of Oricutron's debugger, please refer to the actual documentation page. The core of the profiling feature is the clock cycle counter, visible on the main debugger page. 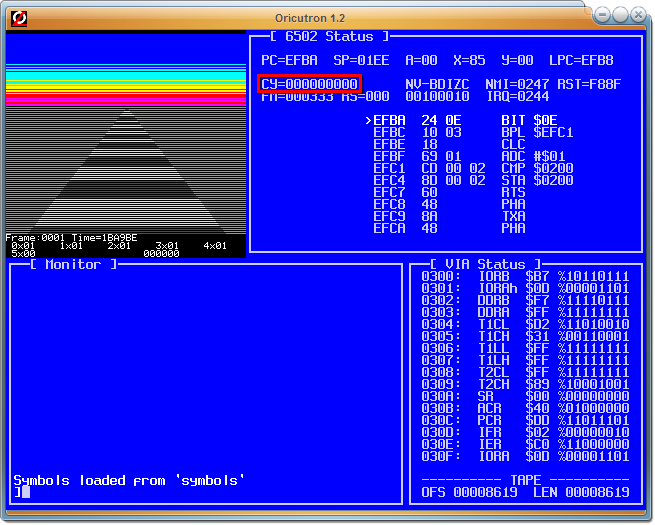 The idea is that each time Oricutron executes a 6502 instruction, it increases the value of the CY counter by the correct amount: If you write down the value at the start of an operation and then compare with the value at the end of the operation, the difference is the number of clock cycles spent running it. Please note that the value is displayed in decimal instead of hexadecimal: What you read is really what you got! You can read more about the feature on the forum post. The Oricutron built-in cycle counter is ideal to get quick results easily, but sometimes it is nice to have something that gives a bit more information, or is able to analyze the performance of more than one routine at time, or do statistics over time. This is where the profiler routine comes in. As of today, this is not yet integrated in the OSDK, this is just some test code I had written for myself5 which I'm now sharing. Hopefuly I can figure out a clean and easy way to integrate that in the OSDK as a native feature. A the moment, the code is available in my SVN user folder. Some other strategically placed macros and function calls will take care of tracking all that and finally report the results on the screen (in the three last lines of TEXT) and on the printer output (which on most emulators gets printed into a nice text file). At the minimum, you need to initialize the system by calling ProfilerInitialize, and then each new frame you need to call the ProfilerNextFrame function, and at the end call the ProfilerDisplay function6. These functions are available for both C and Assembler routines thanks to the use of macro expansion. For assembler modules you can streamline the code by using PROFILE(id), the LEAVE will automatically be called on the first RTS encountered in the code. 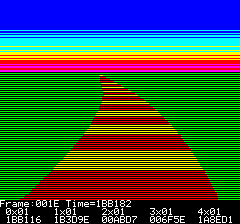 From this we can see that the main loop takes around 1812926 (1BA9BE hexa) cycles, which is roughly equal to 90 frames (1812926/19968), so almost 2 seconds per screen refresh! This is not surprising considering this was a C prototype containing some particularly inefficient code. The two fastest routines in the profiled code are ScrollColors and TurnLoop with respectively about 44000 (2.2 frames) and 28510 cycles (1.5 frame). But it allows us to see what the cost of the profiler is: The actual profiler loop on the first frame was 1BA9BE and the MainLoop was reported as 1BA952. This is a difference of 108 cycles, it's not going to kill you, but if you have to call the same small routine very often this may start to take a significant amount of time. The two actual biggest offenders are DrawRoad (1B35DA) and DrawLoop (1A870D), which take almost as much time as the main frame time! How is that even possible? Normally you would optimize first what takes the more time to run, but another viable strategy is to try to fix a smaller routine that has similar type of code as the large one, and extrapolate the performance gain of the smaller routine to evaluate if it makes sense to even bother optimizing the larger one. So, let's look at this TurnLoop routine. Right now it's reported as about 006F5E by the profiler. These are actually two different routines, one that adds and the other one that subtracts, but they use the same profiler ID because their performance profile is identical. Considering how simple this code is, there's not much optimization that can be done if we stick to C, so let's turn to 6502 assembler instead! As you can see, TurnLoop has reduced from 006F5E to 0012CC (and the global frame time from 1BA9BE to 1B456A), which is a reduction by more than 23000 cycles, more than a full frame difference! This new code is indeed almost 6 times faster than the old one, despite not being optimal at all. Now, would that be enough to have this whole code run at full speed without the emulator turbo mode? No, with 89 frames in total we have much more work to do, but considering the rendering loop is using CURSET and DRAW, there is a lot of room for improvement! An integration will probably happen at some point, but that will require some work to make it easy to use by everybody. I hope at least you learnt some things from this article, and that you now have a better idea on how to measure where you lost the CPU time in your program!